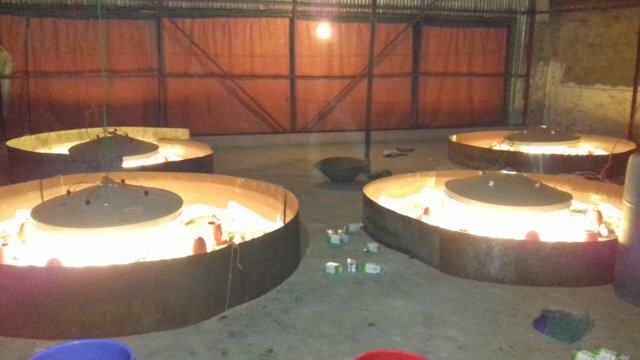 I would like to share our latest batch of the chicken farming business update with you. You will able to watch the video on @dtube in the above. It was the first day of the chicken when I was recording the video. We started our 7th batch on 20th February. It was a long gap between 6th and 7th batch because of the winter season and the price instability. They are so small for taking care of themselves :). We arranged the boarding rooms for them which gives them a warm temperature they need the first few days of their life. Four separate rooms were made and they look happy. They were making a crowd when I go close to them. We spent only 20-30 minutes to complete the work there. There is not much work to do as they don't need much water and food. I am happy that at last, we started the batch but we need to wait to see if the market price decrease. 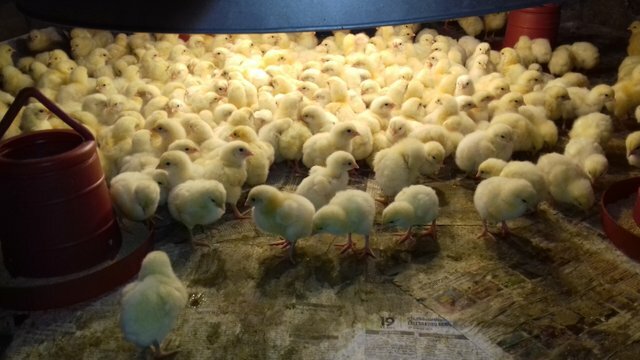 We have taken some risk this time as the chicks price is 10 taka more than the previous batch. Let's hope best and wait to see how the market treats with us. Please contact me @Azizbd for any information https://steem.chat/direct/azizbd . Adsactly is a Autonomous Decentralized Society Acting Cooperatively to Leverage You. Good luck with your project! Visiting from #powerhouscreatives (@steemitbloggers) Thanks for your support! Thank you for your support too. I am glad to be helpful with my votes. I am happy to see many good steemians are involved there and can't wait to see it is winning. I have seen some of your works thanks to @girlbeforemirror and I'm amazed at how much you're giving back to society. Thank you for the generosity and the video of the kids wearing their new school bagpack definitely brightened up my day. Also, thank you for supporting the #powerhousecreatives AKA @steemitbloggers in our fight for the dpoll contest! Thanks for your kind words. @girlbeforemirror is doing a lot for the slum kids. Last year she sent warm clothes, education materials, gifts to the slum kids and beauty products for Bangladeshi women. Also did contribution to buy a sewing machine to train the mothers through @WomenEmpowerment. I am glad to see the traffic from @steemitbloggers and I hope the real community will win. I will ask my native community @Steemitbd Members to join with the fight. Glad to know your connection with @girlbeforemirror. She is very close to me and my projects for more than 1 year. I wish all the best for the community as always and congratulations on the big win which it deserves. Most welcome and have a nice day. She is one amazing person I need to know more about. @girlbeforemirror!!!! I'm glad to know you through her contacts because you're like a breath of fresh air of positivity and love on the blockchain. Keep it up man! She is indeed a real inspiration to me. I am doing my best to keep my work continue. Congratulations to all the members and supporters. Finally the big win. I feel really happy to see nice support from your community. Thanks for sharing with community members. @azizbd, I am humbled by your comments, and a bit embarrassed. I don't believe they are warranted, especially with respect to recent months. I used to try harder to do things. My involvement in the world outside my door, whether physically or via on line communities has diminished, as I became more entrenched in my own insular problems. You remind me of the personal gains that can be found by looking past my own issues, and remembering that the world beyond my own window is full of people with challenges. More complex and frightening than my own. The mothers and children in your community are the true inspiration. Those pictures of the tiny little tired mothers. At first glance I see weary and vulnerable, but they are stronger and more determined than anyone. They keep going for their children everyday, in circumstances most people you interact with on steemit don't even wish to imagine. I hope you are able to continue your work. I know it has been hard for you, not only because of the down turn in steem, but for the many hats you wear. As teacher, mentor, brother, son, business owner, student, freelance working at night, farmer, charity worker, activist, student. And you are to me barely an adult but wiser and more mature than most people playing at adulting. I hope to come out of my reclusive state. With my house move and my adoption by these lovely creative folk, I hope to have more purpose and also to use that purpose to good use. With your guidance, I look forward to collaborating on initiatives that will help you as you reconfigure your goals, both personal and community. I'm so proud of you Mohammed. And proud to call you friend. I'm very impressed with your program and your generosity! I'm following now so I can support more of your posts. And thank you for supporting @steemitbloggers and AKA #powerhousecreatives. Good people helping each other, it's a beautiful thing! Those chicks are so cute, and so loud! LOL! Best of luck with the market price - I know everyone in the @steemitbloggers group is crossing their fingers for you! Thank you very much. @kenny-crane and I invested our steem to start the farming business last year. I often try to share it on @dtude . Really appreciate the support from @steemitbloggers . @azizbd Hi, a long time since the Tsu days that we talked my friend. I see you are still beating the odds and continuing with your work and so are we. Too much work to party my friend and so good to talk to you again. I hope I didn't get it wrong that we were friends on Tsu? Nice to know your experience with them. It is really a good business but needs huge labour. My brother mostly works there and I try to help him in the evening time or if there need any help. Thanks a lot for your support and comment. Reaaly great to see projects like this one. One's spirit gets inspirated to start one on our own. Cheers! Thank you so much for all the information about our chicken business! I'm sorry I didn't reply sooner but I am moving and I have to get everything out of my house. When I have time I will talk to you more on Discord. Thanks for leaving me a message there too! They're adorable. I hope prices are good this year. It's sad to think of how much we are paying for things here in the US that are 'homegrown' and the small penece in comparrison that the rest of the world gets. Also thank you for your support of PHC, we greatly appreciate it. Your UA account score is currently 4.279 which ranks you at #2708 across all Steem accounts. In our last Algorithmic Curation Round, consisting of 221 contributions, your post is ranked at #52. Awwww...I bet it's interesting and exhausting raising chickens! Howdy from Texas azizbd! Hey those chicks look really good and I hope they continue to thrive! How many are in that room, 500? May your business flourish in the future! Thank you for all your support for the PHC community!